friend arranged to watch x-men apocalypse 3D Imax at shaw lido on 25.5.2016. 3 of us went for the movie. after the movie, we had lunch at watami. the stone pot set includes salad & drink. we orderd all 3 & all were good. a friend had the salmon. i tried. it was very flavourful & of the 3 this the one i liked best, and i did not even have the ikura. another friend had the pepper beef. flavour also very good. i did not want to take tis as it looked like th food court pepper lunch, but actually it as very flavourful. 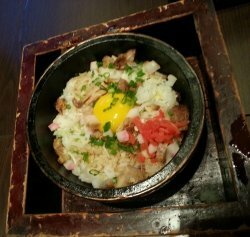 i had the pork stone pot set. it had more ingredients than the pepper beef but both were ok with me. the salad was quite standard, simple but still quite nice. for the drink, a friend had hot yuzu tea. 2 of us had the coffee which was quite ok.
Go for the appetisers: they are satisfying enough! 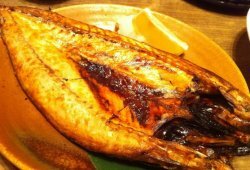 Most people would go to watami for their main courses or set lunches and dinners. However, ordering two or more options from the appetisers and starters could just be as filling and satisfying! 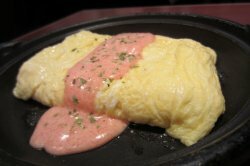 of course, not all food items taste equally good.. such as the omu rice. the egg was really flat and didn't taste as fluffy as i'd like. would prefer if they used a larger egg so that there could be more egg white. 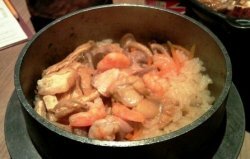 the rice should have some spices or ingredients as well because the flavours were mainly from the sauce. it got too plain after awhile. 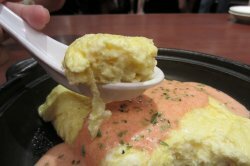 i love how there were layers of egg, but the overall flat texture wasn't satisfying enoguh. 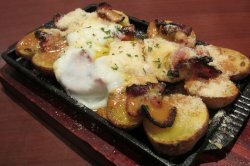 highly sinful, the mentai cheese potato with bacon can make you feel really full. it's a lovely dish to be shared among friends! the grilled taste that lingers on your mouth is fantastic — it adds on to a flavoursome and comforting meal, especially on a cold day. 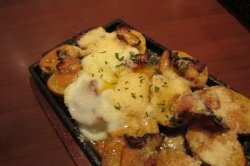 the potatoes and cheese remain piping hot even after a long while, perhaps due to the conduction of heat on the metal plate. 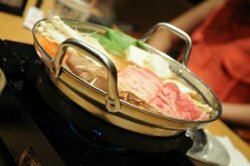 Watami is another Japanese restaurant with a pronounced presence in Singapore, with 8 outlets scattered around the island. Yummy! 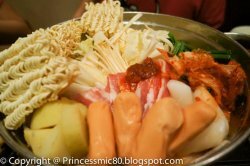 Like this kimchi nabe... 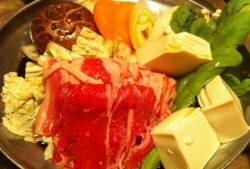 It is something like "steamboat"! My favorite! You can replenish the soup for free la... 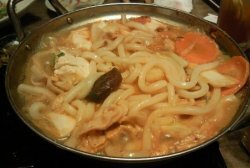 I like the udon! Hot! 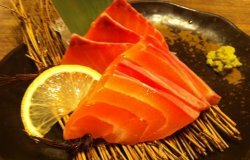 But one thing about it is that, they only provide beef or pork..It will be good if they have seafood for this..haha.. but perhaps I can just order some salmon and throw it on la..Overall..this is the only item I like tonight! 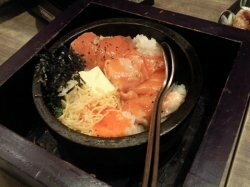 Salmon stone rice..again quite salty lor! Don't really like this! Today lunch away from office. Me and my friend, which happened to pop by, were feeling extremely hungry so we decided on rice today. 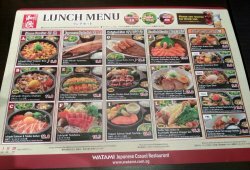 As Watami Japanese Casual Restaurant was having no queue, we decided to give it a try. 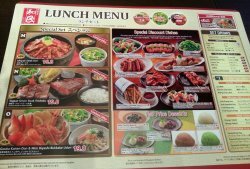 Their lunch menu's price was quite reasonable and also there was quite a variety to choose from. 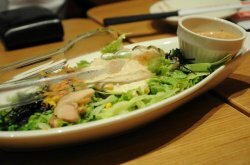 We can choose a Main dish and it will come with a salad, soup and drink. 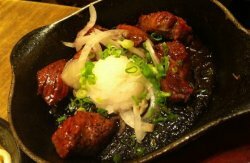 I have ordered Ishiyaki Steak Don Special Set (Beef Short Ribs, no bone, with rice) which cost S$16.80. It actually taste like the beef pepper rice version in "Pepper Rice". The so called short rib beef was actually thin slices of beef. A lot of sweet corns was added. 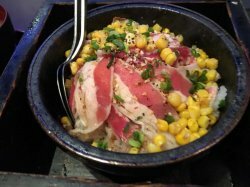 Overall taste was not as good as "Pepper Rice". 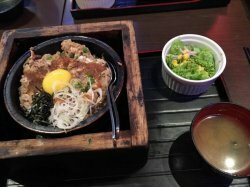 My Friend ordered Ishiyaki Chashu Chahan (Fried Rice with Chashu and a raw egg on top) S$11.80. The chashu were so little that they got lost in the bowl of rice. 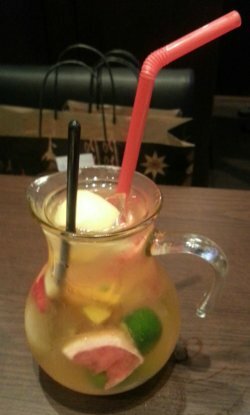 Something different was the Fruit green tea which we can't resist to order. There were Grapefruit, orange, calamansi, kiwi, strawberry, lemon and honeydew. Sounds grand but actually not much taste from the fruits I mentioned. My 2nd time visiting Watami in a month, for which both time I was in some circumstances for which I wasn't able to order the usual number of dishes I usually do. This time I visited the outlet at Ion Orchard and for all I remember, the queue there is always long in the evening. 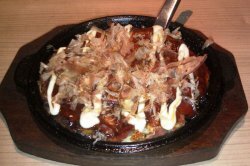 Have ordered the Mochi Cheese Okonomiyaki to share with my friend. 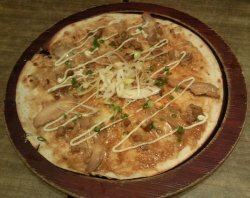 This savoury Japanese pancake with mochi cheese was so filling we were both full even before finishing half of it. The batter was mixed properly such that I didn't taste anything bad but for some reasons, I didn't really like it. But my friend enjoyed it, probably because he's a cheese and pancake lover at the same time. Overall, I love the environment at Watami and do hope that I would be able to order more during my next visit. Watami at ION Orchard was recently given a facelift. The restaurant is a lot smaller now but the interior looks a bit more posh and they even have some brand new dishes on their menu. I ordered myself a Tonkotsu Ramen and Miso Yakionigiri set. 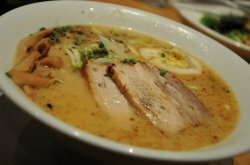 The ramen came in a nicely plated huge bowl with an onsen tamago. 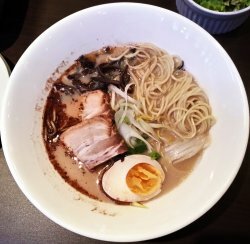 If you prefer eating your chashu meat hot, then it would be advisable to let it soak in the soup for a while because it was served to me cold. The noodles are pretty good although the soup broth was a bit too salty for me. 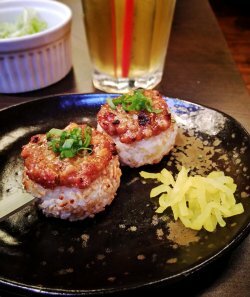 This is the first time I've heard of Yakionigiri - "onigiri" is a rice ball and "yaki" usually refers to dishes that have been grilled or fried. While it was a bit oily, I enjoyed the natural saltiness of the miso paste that has been generously slathered on top of the fried onigiri. And it makes for a very interesting side dish! You should try it for yourself..
On a normal day when we were not exactly feeling starving at all, we ended up ordering a $59 set for 2. It was such a great deal that we just cannot missed! See? So much for just $59. If you were me, you would be tempted as well right? I had some time to kill before meeting the client so I went for a desserts at Watami. At the time I went, it is already 2pm hence there is no crowd at all. I ordered the Matcha Parfait, which costs $6.80. 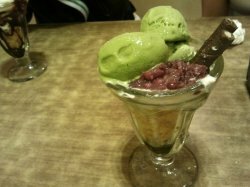 The Matcha Parfait has two scoops of green tea ice cream together with cream and red beans. The bottom of the glass is chocolate, followed by cornflakes. There is also a oreo stick. The presentation wins a lot of points as it is visually very attractive. The taste is also good. 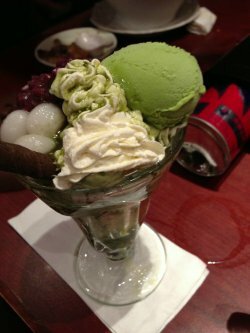 The green tea ice cream is not too sweet and the cream is very smooth and it makes the ice cream very creamy and smooth when eaten together. The red beans are also soft and delicious. It is quite hard to reach for the toppings at the bottom of the ice cream though. I had to eat one scoop of the ice cream first before I could reach the cornflakes. The combination of all the ingredients work and I really enjoy the parfait. Always expecting long queues for watami (ion outlet) during meal hours. So i came to watami at around 530 the other day and there were no queue! happy happy. 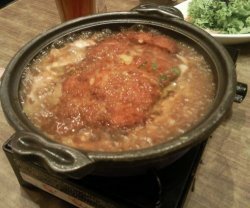 I love their pork cutlet! the deep fried skin taste so good. 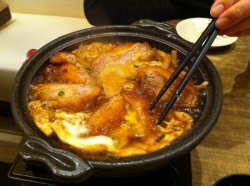 The meat is well marinated too and together with the sauce it makes this hot plate dish very yummy! egg is also given for us to add into the hot plate. 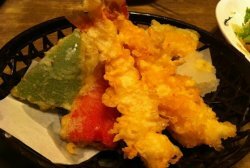 This is actually my 3rd time to Watami but first time writing a review here and this shows how much I love their food there. Their set meal is super value for money especially I get to eat a lot of variety of food from their set meal! Previously is just me and my bf so we only get to eat their set meal for two! This time round, we got a pax of 4 and we go for their deluxe set meal! 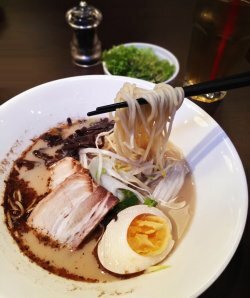 Some of the dishes that is worth trying (I feel). I'm not really a salad fan but I'm totally in love with the salad! 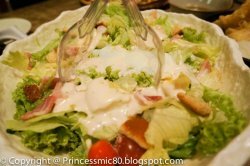 The salad is super fresh and the half boiled egg adds more freshness to the vegetables! I love the crispy breadcrumbs too! Next is their Korean Army Pot (kankoku butechige)! I am totally in love with this! The soup uses miso as a base, the kimchi added some spiciness to the soup which blends super well with the instant noodles and Korean rice cake! You can also order additional rice cake / noodles at 1 bucks per plate. Will i go again? of cos! Needless to say, this is already my 3rd time to this restaurant in this year! 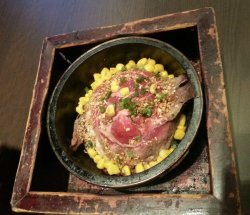 Watami is a nice casual japanese restaurant. 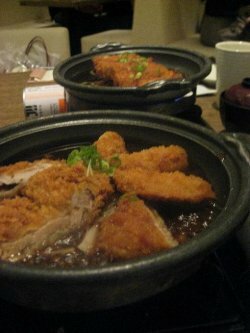 It gives people a nice atmosphere to spend time with friends especially friends who love japanese food. 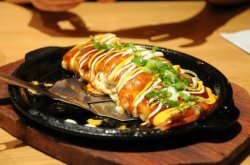 I would definitely recomment this Tonpeiyaki which is a a Japanese omelette with pork, cheese and cabbage rolled in it, topped with mustard and okonomiyaki sauce. This place Gets crowded and noisy during lunch hours depending on the age of crowd. Sometimes there are loud teenagers around here. The staff is very helpful and responsive. They are quick when there's not much crowd but service may slow down when overwhelmed, just a matter of manpower delegation. We ordered Grilled beef and Tonkotsu (pork). 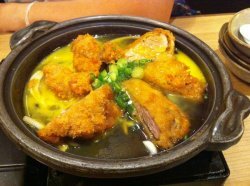 The smell of the pork bubbles in the sauce entices my senses to start dining! 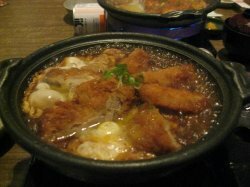 The pork is moist yet crispy; the breaded pork cutlet soaks up the flavorful eggy sauces. 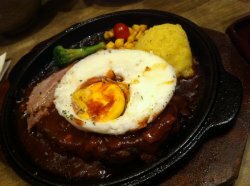 The beef sizzles on the hotplate yells "Eat me" it's very tender and well cooked; the edpotato is creamy and smooth absolutely a perfect match. Thumbs up! ION has floors and floors of shops which you can spend one weekend date here. We found ourselves at Watami for some Japanese cuisine. We ordered the Stonepot Beef and Tonkatsu. The beef was well marinated, well-balanced of meat and veggies. 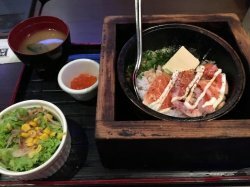 They have an additional square wood bowl to protect you from getting burnt while keeping your dish warm as you eat in nice cold air-con. The pork was nice and tender. 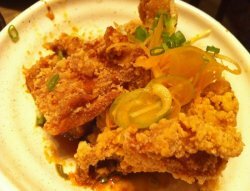 The amount of crispy batter on the outside is just right as the meat is quite thick and worth as you bite. Some people like it soaked in the egg/soup: that depends on individual preference. This place is always crowded and has a queue. Nice decor, but a busy Japanese restaurant. 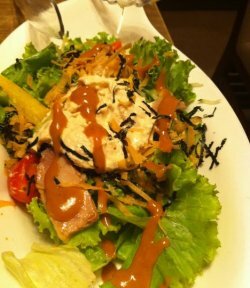 The staff are friendly and sincere, though at times slow service due to overwhelming crowds. One of my favourite place during tea time! Watami is the second place I will go to if I have the coffee jelly craving. It is one of the places with a more affordable price and decent quality. Which is, not diluted or not sugar overdosed. The friend ordered the Matcha and Azuki Beans Parfait while I went for my usual and I eat 3 - 4 cups normally (not pictured here). I don't fancy the parfaits here as the ice cream are probably from a cheaper brand as the matcha taste like green tea and the dollop of whip makes everything else much sweeter. My friend regretted ordering it and she left the whole cup there.